Rabbit anti Bovine, Chicken, Human, Mouse, Rat, Sheep 14-3-3 protein gamma. Antiserum Preparation: Antisera to sheep 14-3-3 gamma were raised by repeated immunisations of rabbit with highly purified antigen. 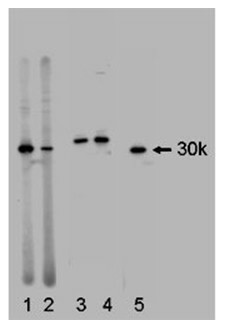 Western Blot: 1/6000-1/12000; detects a band of approximately 30kDa in HEK293 cell lysates. Immunohistochemistry on Paraffin Sections: 1/800. Sheep, Mouse, Human, Bovine, Chicken, Rat. 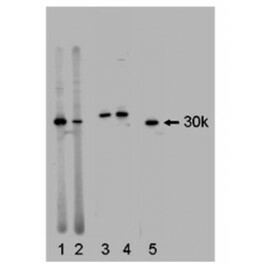 This antibody recognises the acetylated N-terminal of 14-3-3 gamma.